A new study by an international team of astronomers reveals that four Earth-sized planets orbit the nearest sun-like star, tau Ceti, which is about 12 light years away and visible to the naked eye. These planets have masses as low as 1.7 Earth mass, making them among the smallest planets ever detected around nearby sun-like stars. Two of them are super-Earths located in the habitable zone of the star, meaning they could support liquid surface water. The planets were detected by observing the wobbles in the movement of tau Ceti. This required techniques sensitive enough to detect variations in the movement of the star as small as 30 centimeters per second. “We are now finally crossing a threshold where, through very sophisticated modeling of large combined data sets from multiple independent observers, we can disentangle the noise due to stellar surface activity from the very tiny signals generated by the gravitational tugs from Earth-sized orbiting planets,” said coauthor Steven Vogt, professor of astronomy and astrophysics at UC Santa Cruz. The outer two planets around tau Ceti are likely to be candidate habitable worlds, although a massive debris disc around the star probably reduces their habitability due to intensive bombardment by asteroids and comets. The same team also investigated tau Ceti four years ago in 2013, when coauthor Mikko Tuomi of the University of Hertfordshire led an effort in developing data analysis techniques and using the star as a benchmark case. “We came up with an ingenious way of telling the difference between signals caused by planets and those caused by star’s activity. We realized that we could see how star’s activity differed at different wavelengths and use that information to separate this activity from signals of planets,” Tuomi said. Sun-like stars are thought to be the best targets in the search for habitable Earth-like planets due to their similarity to the sun. Unlike more common smaller stars, such as the red dwarf stars Proxima Centauri and Trappist-1, they are not so faint that planets would be tidally locked, showing the same side to the star at all times. 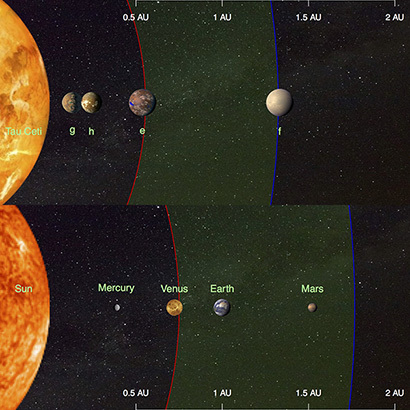 Tau Ceti is very similar to the sun in its size and brightness, and both stars host multi-planet systems. The data were obtained by using the HARPS spectrograph (European Southern Observatory, Chile) and Keck-HIRES (W. M. Keck Observatory, Mauna Kea, Hawaii). A paper on the new findings was accepted for publication in the Astrophysical Journal and is available online. In addition to Vogt, Feng, and Tuomi, coauthors include Hugh Jones of the University of Hertfordshire, UK; John Barnes of the Open University, UK; Guillem Anglada-Escude of Queen Mary University of London; and Paul Butler of the Carnegie Institute of Washington.